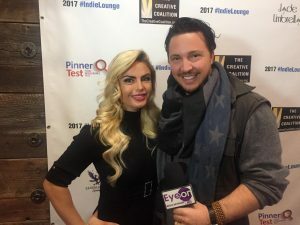 Host Max Tucci with actress Tia Barr at #IndieLounge at Sundance Film Festival. Catch her tonight on Reelz Rich and Acquitted. Tia Barr is a Los Angeles based Actress and TV Host. Tia Barr’s diverse abilities have produced roles in everything from playing the role of Daisy May acting opposite of Jim Carrey in Cold Dead Hand to portraying Marilyn Monroe on the Emmy Award winning show Modern Family to playing Annie Chapman in Alfred Hitchcock’s murder mystery remake feature film The Lodger & such TV drama’s as Son’s Of Anarchy.